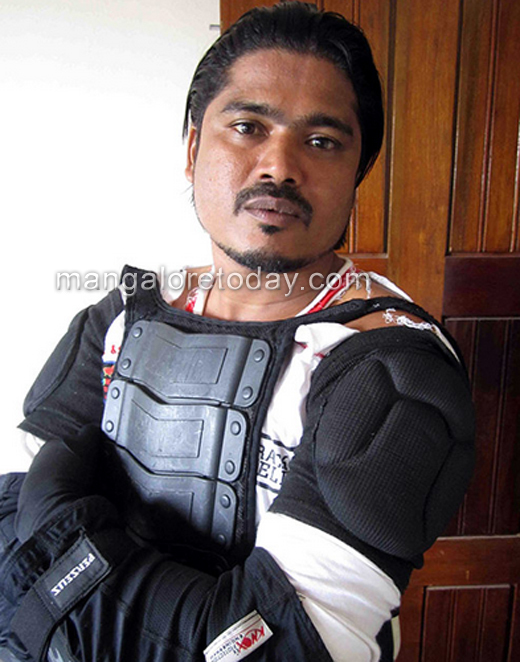 Kasargod, Aug 14, 2014: A dreaded criminal who was wanted in several cases including murder and dacoity was arrested by a police team led by DySP TP Ranjith at Pookatte near Kumble on August 12, Tuesday night. Police also seized 3 kg charas and lethal weapons from his house. The arrested person is Abdul Latif alias Vanande Latif (34) of Arikkady Uluvar in Kumble. A motorbike which was used by him was also seized. According to the police, he was wanted in the case of murder of Shamir of Kumble Arikkady reported five years back. Some other charges against him including dumping an Uppala man in a well at Talassery, assaulting Kumble SI P Narayanan while the latter tried to arrest him, robbery of a bank at Belgaum and stealing valuables belonging to tourists at Ooty. He was arrested in the last case, but was released on bail. Police found his body was wrapped in fabric sheets which they suspect intended at hiding hawala money. However the accused told the police that he has done so as he faces life threat.